It's interesting to remember just how far the pounds, shillings, and pence went over 50 years ago in 1960. Looking through an old Gamages model catalogue from that year, I was reminded of the high prices of Trix-Twin, compared to Hornby Dublo and Triang. Let's take a look at some of the models offered by the three major manufacturers. The Triang 'Princess' was good value at 59/7 (£3). The Triang range of locomotives and rolling stock were produced in plastic, which enabled them to be sold at affordable prices to children. Next, the Hornby Dublo diecast model of 'City of London', which was priced at 81/6 (£4). Dublo models offered realism and quality manufacture. The Trix 'Brittania', although more modern than the Dublo model, was a whopping £6.4.6. (£6.20) That's more than twice the price of the Triang model! If these engines were beyond your means, then how about a coach? Triang's BR Composite was 8/6 (42p), the Hornby Dublo Corridor was 13/9 (68p), and Trix offered their scale-length coaches with lights at 18/11(95p) each. In 1962, Trix coaches with interior furnishing rose to three times the price of Triang! Multiply these 1960 prices by a factor of ten (at least) to give today's equivalents. Yes, some of us would have struggled to save up even for a coach, so we will compare the prices of the humble goods wagon next. The Triang coal truck was 3/11 (20p), Hornby Dublo's sand wagon was 4/8 (23p), and the Trix coal wagon was 5/9 (28p). Pocket money was often used to buy more track, extra points making a layout more interesting. Electric points were very expensive - here are the equivalent 2000 prices: Triang £7, Hornby £10, and Trix £10. Other today's equivalent prices: Coal Conveyor £55, Grand Central Station £130, Meteor £75, Hunt 440 £30, Schools £55 (! ), Class V £57, EM1 £60. If you had asked Santa for a complete train set for Christmas, then the simplest 0-6-0 Triang goods set would have cost Dad 73/- (£3.60). Surprisingly, a Hornby Dublo goods set was only 63/- (£3.15). The cheapest Trix 12 volt set, which included an 0-4-0 tank loco and 5 wagons, was £4.75. 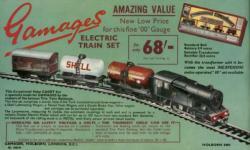 The Trix Cadet set, which ran on 6 volt batteries, was sold as the Gamages Train Set for 68/- (£3.40) and advertised on the back cover in colour. What should you have bought from the Trix range in 1960? That's an easy question to answer now: Weltrol wagons with granite block load at 72p each (current valuation is approximately 100 times the 1960 cost) and Engineers' Coaches at 45p each (current valuation is more than 100 times the 1960 cost!). At the time these items did not sell, because the granite block was the least interesting of the Weltrol loads, and the plain Engineers Coach was unattractive and unrealistic. As mentioned earlier, my Gamages Model Books provided the pictures and prices for this article. 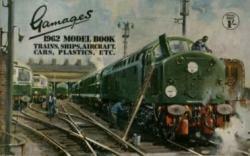 Priced at 1/-, the books also illustrated and catalogued the models of Frog, Keil Kraft, Corgi, Dinky, Minic, Spot-On, Scalextric, Airfix, Revell, Meccano, Mamod, and many more. A Frog 1cc model aeroplane diesel cost £2.50, Corgi Ford Classic 24p, Dinky Ford Anglia 18p, Scalextric Grand Prix set £8.90, and Airfix Dakota 30p. The Meccano Outfit 6 and the Mamod steam roller were £4.50 each. 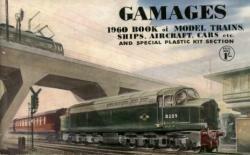 Gamages Model Books featured paintings from famous railway artists, including Cuneo, on the front cover each year, and are well worth collecting. The actual store, in Holborn, featured a 'mammoth' model railway 85ft by 10ft with sixty trains made by Hornby, Marklin, Triang and Trix. My local model shop in the North-East featured a compact but impressive Marklin display layout. Aged 11 in 1960, I recollect spending most of my Christmas money at this shop on a TTR Manyways clock-tower - very expensive at £1. If only I'd chosen an Engineers Coach and a Weltrol with Granite Block!